When the Czar abdicated, he was replaced by a Provisional Government as a result of the February Revolution. During the next several months there was a struggle for power, and many protests and strikes took place. Much of the February Revolution took place in the current city of St. Petersburg. The October Revolution is when Lenin and the Bolsheviks overthrew the Provisional Government and seized power appointing themselves as leaders of the various government ministries. Both of these revolutions resulted in what would be Russia's Civil War. The Bolsheviks would arise victorious. For more on the Russian Revolution of 1917 click here. Stalin rose to power in Russia after Lenin had died in 1924. Well known as one of the most brutal, violent, and evil men in history. Though he was not a significant player in the Bolshevik seizure of power, he was high enough in the ranks of the communist party to maneuver his way into the role of dictator. For more information on Stalin click here. 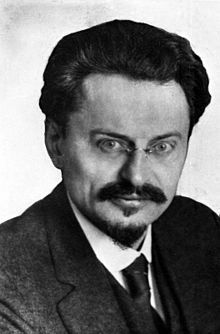 Trotsky, second only to Lenin during the Bolshevik seizure of power, seemed to be the next in line for power when Lenin died in 1924. He was out played by Stalin in the struggle for power that took play after the death of Lenin. While in exile in Mexico, he was assassinated on the order of Stalin. For more information on Trotsky click here.